BERLIN (AP) — Robert Lewandowski scored his 100th and 101st Bundesliga goals on Saturday as Bayern Munich defeated Mainz 3-0 for the club's seventh win from seven games in the German league. Lewandowski, who scored five goals in only nine minutes against Wolfsburg on Tuesday, opened the scoring in the 51st with a header just inside the left post, then rounded the keeper for his second in the 63rd. It was Lewandowski's 10th goal of the season. The Poland striker now has 27 in 37 league games for Bayern, having scored 74 for Borussia Dortmund before his 2014 switch. "You always have to believe that you're going to score," said Lewandowski, who lifted his jersey to reveal a shirt with the number 100 emblazoned across the front. Kingsley Coman, who produced an outstanding cross for Lewandowski's opener, converted Douglas Costa's cross from close range to complete the scoring in the 68th. It was the 19-year-old Frenchman's second goal in three Bundesliga games since he switched from Juventus in the off-season. "It's very difficult here. They're a physical team and a difficult team to play. We only had one effort on goal in the first half," Bayern coach Pep Guardiola said. Thomas Mueller struck a penalty over the bar in the 21st and Mainz midfielder Christian Clemens hit the crossbar in the second half. Bayern next hosts Dinamo Zagreb in the Champions League on Tuesday. Elsewhere, Raffael scored late to seal Borussia Moenchengladbach's 3-1 win at Stuttgart, Bayer Leverkusen won 3-0 at Werder Bremen, Hoffenheim beat Augsburg 3-1 and bottom side Hannover held Wolfsburg to a 1-1 draw. Hamburger SV hosted Schalke later. In Stuttgart, Granit Xhaka headed Raffael's free kick inside the far post in the 17th and Patrick Herrman forced an own goal from Christian Gentner to make it 2-0 to 'Gladbach three minutes later. Daniel Ginczek pulled one back with a penalty in the 40th, but any hopes of a comeback ended when Raffael struck on a counterattack in the last minute. "The job was to stabilize the side, get a few points and calm things down. We've managed that," said 'Gladbach caretaker coach Andre Schubert, who has two wins from two games following the resignation of Lucien Favre. He quit after starting the season with five straight defeats. Schubert's side hosts Manchester City in the Champions League on Wednesday. In Bremen, Admir Mehmedi eluded three defenders before putting Leverkusen ahead with a deflected shot in the 31st, Julian Brandt made it 2-0 with an excellent free kick in the 58th and Kevin Kampl sealed the visitors' win with a looping shot for his first Bundesliga goal in the 65th. "It's very special for me," said Kampl, who failed to settle at Dortmund last season. "I feel very comfortable at Leverkusen." Leverkusen next visits Barcelona in the Champions League on Tuesday. In Augsburg, Hoffenheim forward Kevin Volland cut inside two defenders and unleashed a shot inside the right post in the 10th. Koo Ja-cheol equalized in the 38th, but Volland claimed his second from the penalty spot in the 68th and Jonathan Schmid sealed the visitors' first win of the season five minutes later. Wolfsburg striker Bas Dost broke the deadlock against Hannover five minutes before the break, only for Hiroshi Kiyotake to equalize in style in the 57th. The Japan midfielder controlled Manuel Schmiedebach's cross with his chest and then volleyed the ball in off the crossbar as he was falling. Wolfsburg visits Manchester United on Wednesday. 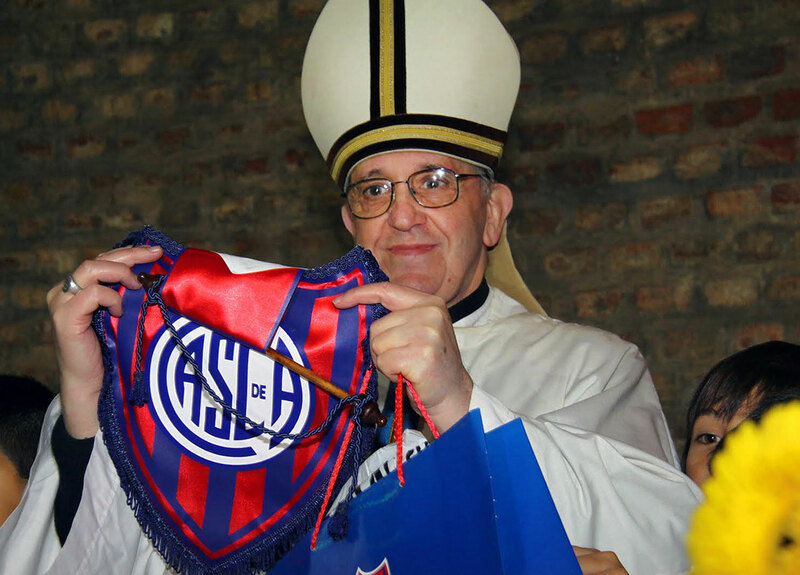 Argentina's Cardinal Jorge Mario Bergoglio (now Pope Francis) poses with the San Lorenzo team emblem, which he supports in Buenos Aires, on May 24, 2011. 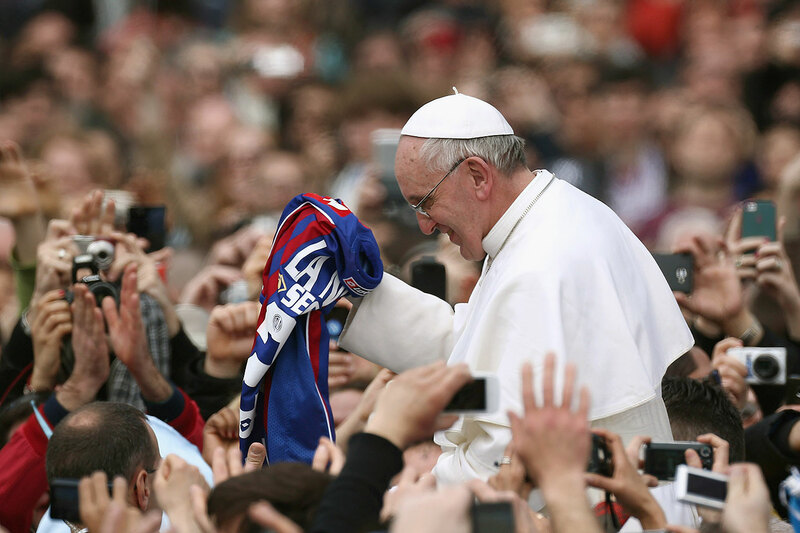 Pope Francis is given a San Lorenzo jersey as he greets the faithful prior to his first 'Urbi et Orbi' blessing from the balcony of St. Peter's Basilica during Easter Mass on March 31, 2013 in Vatican City. 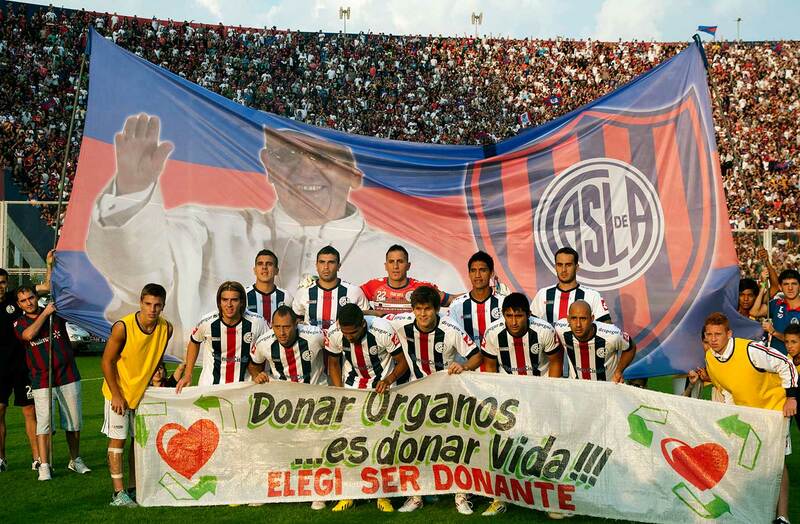 Argentina's San Lorenzo team poses with a huge flag behind them with an image of Pope Francis before the start of their match against Newell's Old Boys on March 31, 2013 in Buenos Aires. 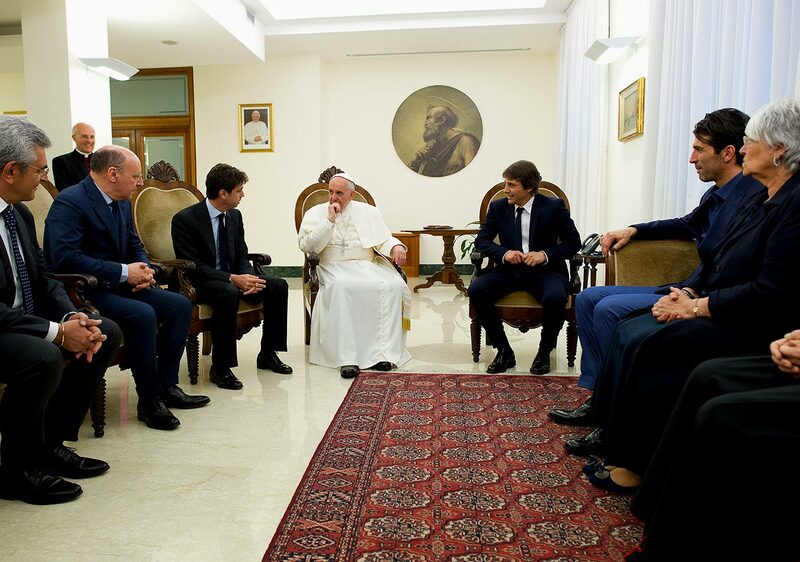 Pope Francis talks with Juventus team president Andrea Agnelli (left) and coach Antonio Conte (right) during their audience at The Vatican on May 21, 2013 in Vatican City. 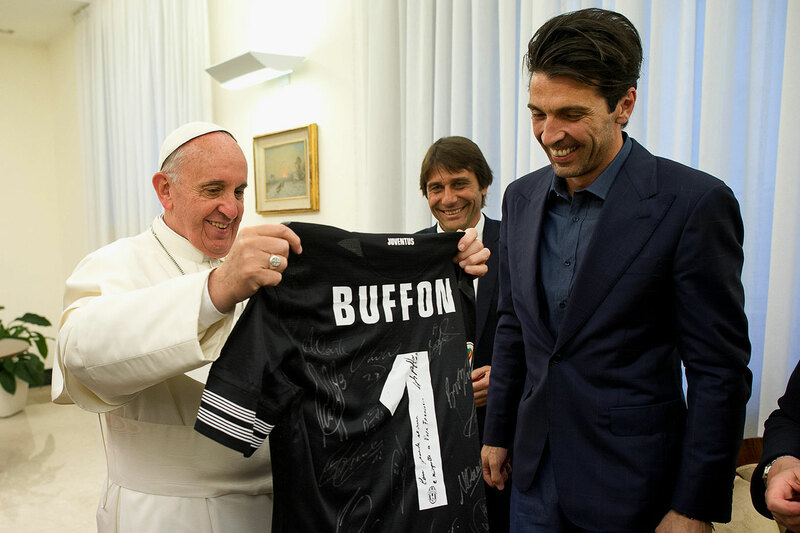 Pope Francis receives an autographed Juventus jersey from captain Gianluigi Buffon (right) and coach Antonio Conte at the end of their audience at The Vatican on May 21, 2013 in Vatican City. 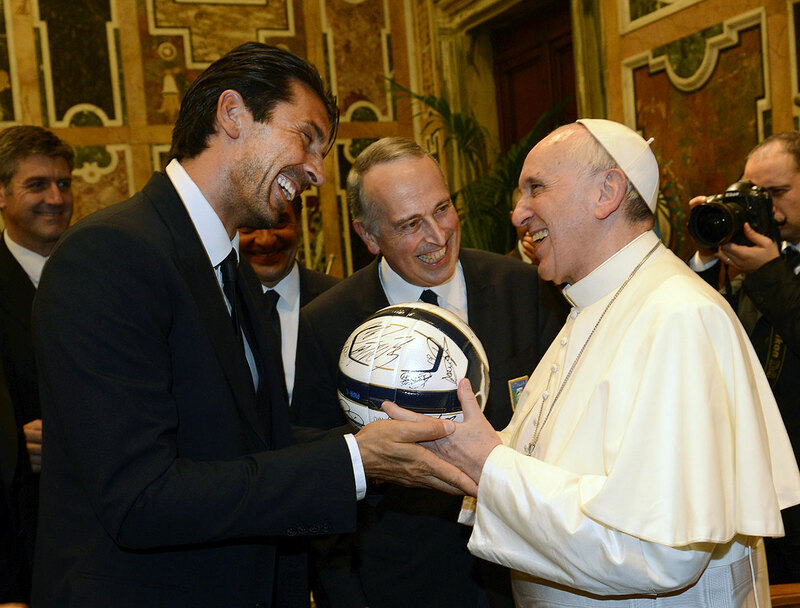 Pope Francis exchanges gifts with Gianluigi Buffon of Italy's national team during an audience at The Vatican on August 13, 2013 in Vatican City. 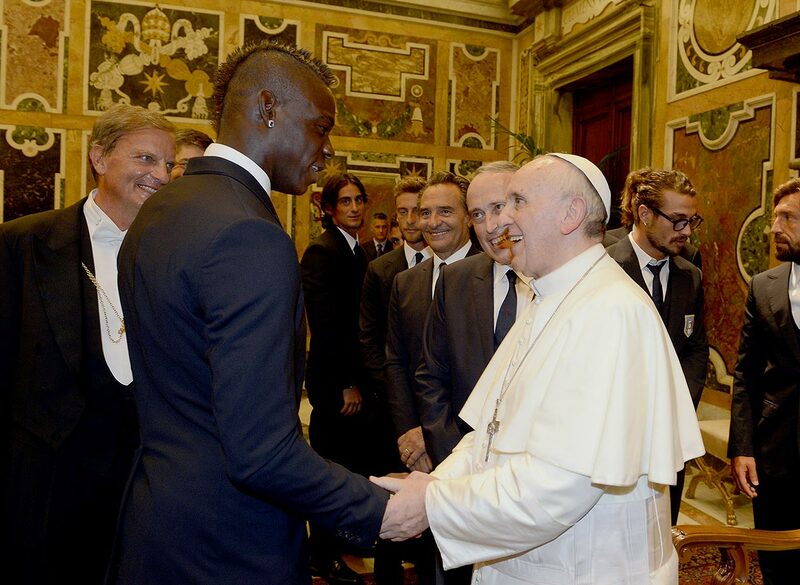 Mario Balotelli of Italy's national team shakes hands with Pope Francis during an audience at The Vatican on August 13, 2013 in Vatican City. 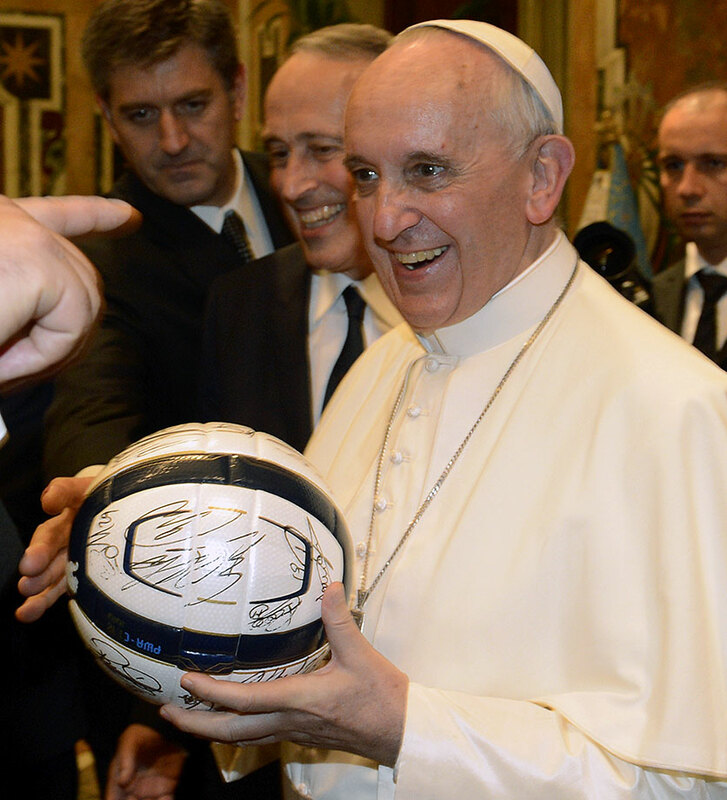 Pope Francis holds an autographed soccer ball from Italy's national team during an audience at The Vatican on August 13, 2013 in Vatican City. 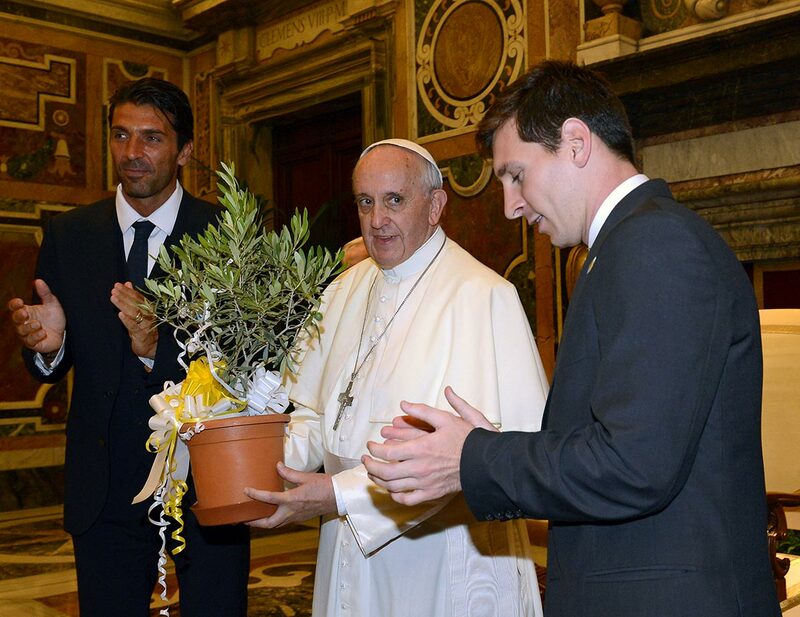 Pope Francis exchanges gifts with Lionel Messi and Gianluigi Buffon of Italy's national team during an audience at The Vatican on August 13, 2013 in Vatican City. 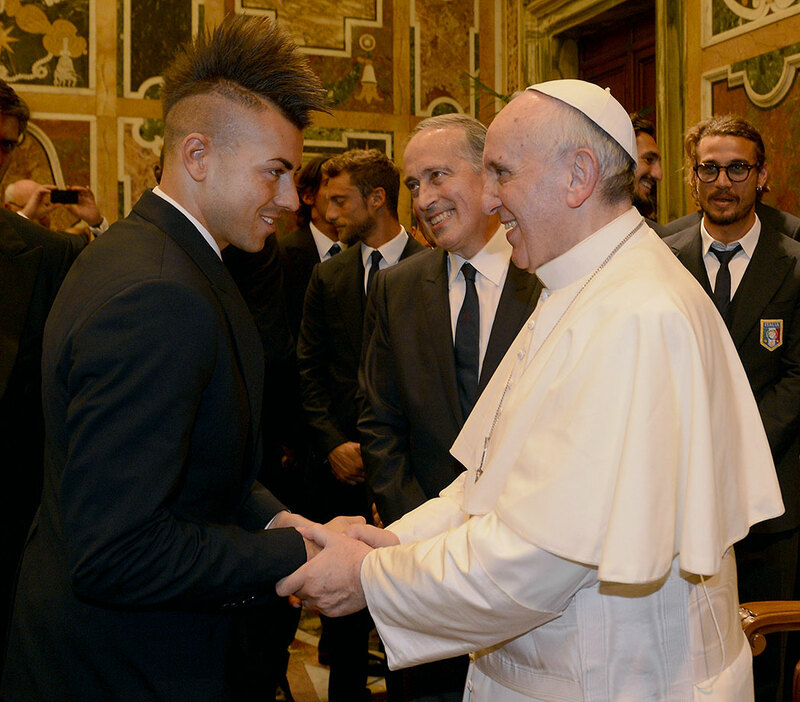 Pope Francis welcomes Stephan El Shaarawy of Italy's national team during an audience at The Vatican on August 13, 2013 in Vatican City. 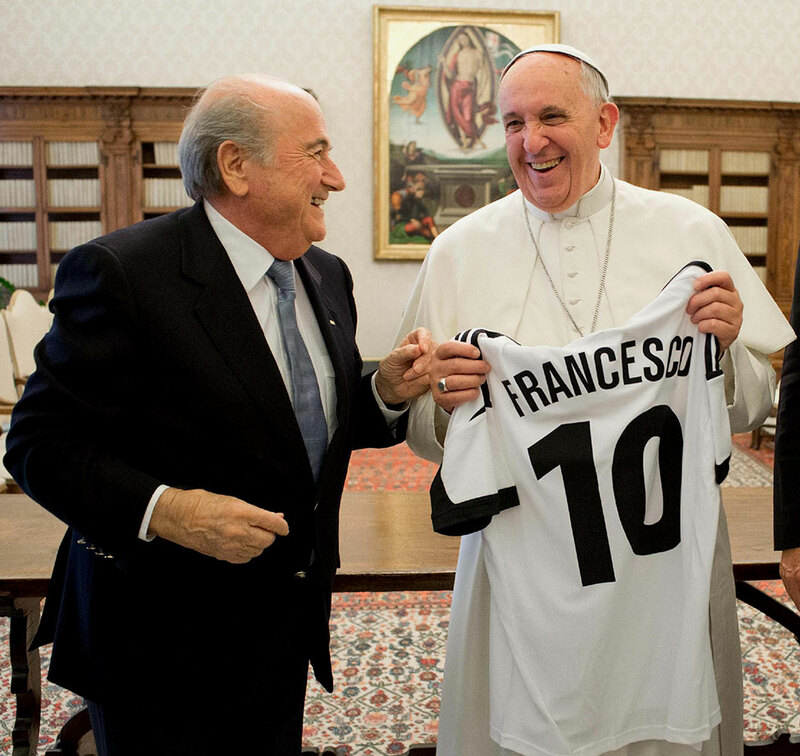 Pope Francis smiles as he receives a jersey from FIFA President Sepp Blatter during a private audience at The Vatican on November 22, 2013 in Vatican City. 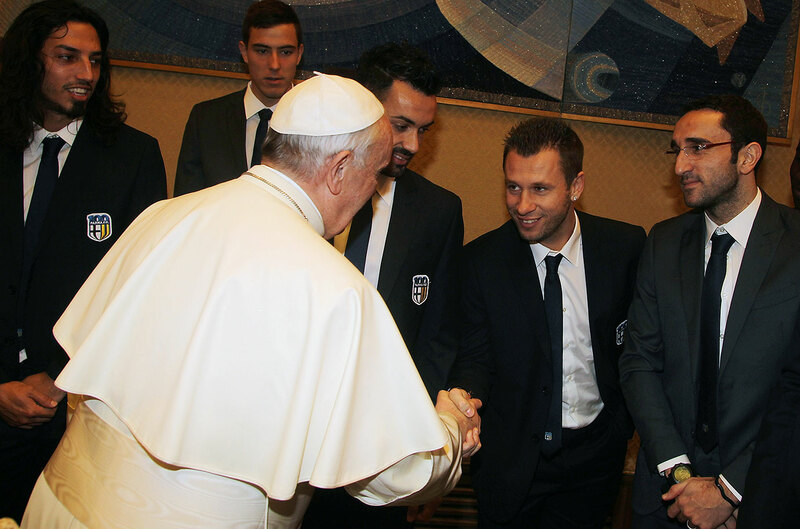 Pope Francis shakes hands with Antonio Cassano of FC Parma during an audience at The Vatican on February 1, 2014 in Vatican City. 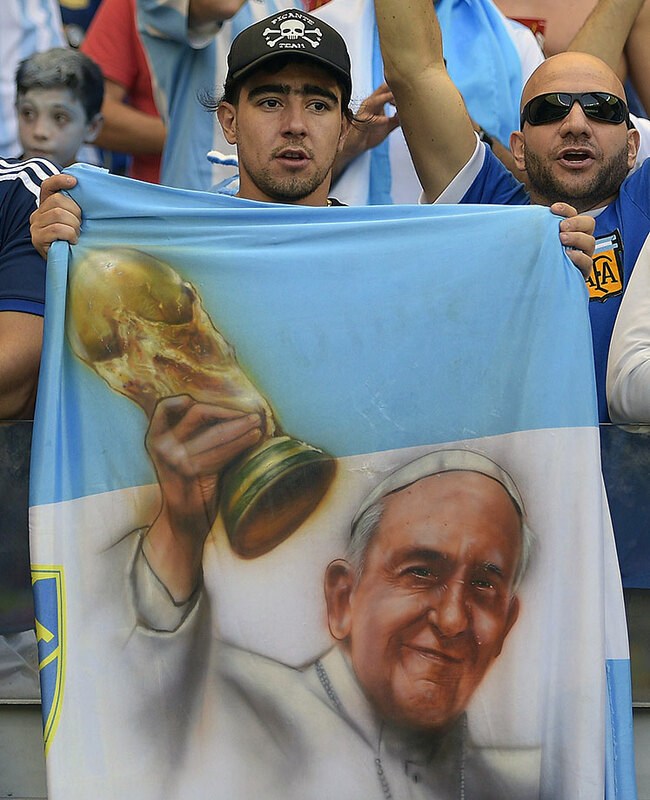 An Argentina fan holds a flag with a portrait of Pope Francis prior to a Group F football match between Argentina and Iran at the Mineirao Stadium in Belo Horizonte during the 2014 FIFA World Cup in Brazil on June 21, 2014. 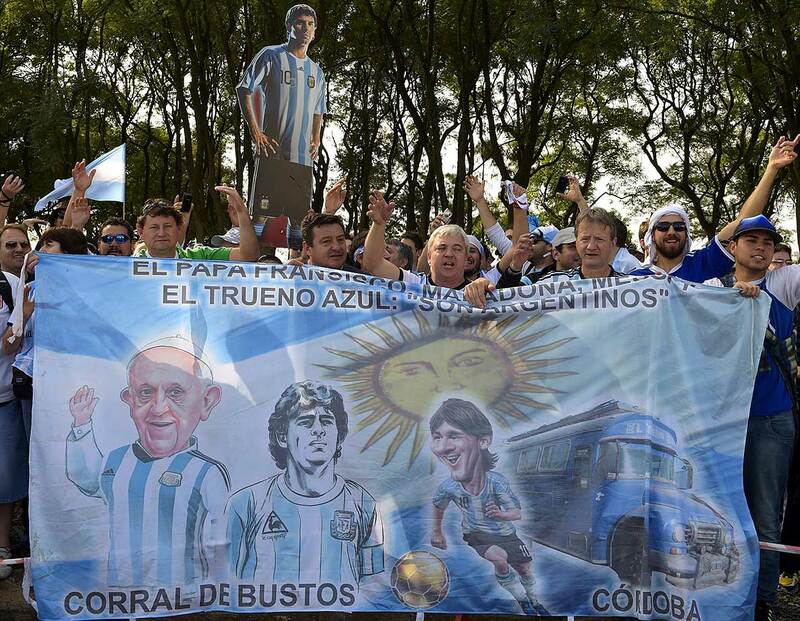 Argentina's supporters hold a banner depicting Pope Francis, Diego Maradona and Lionel Messi as they wait for the arrival of Argentinian players outside the Beira-Rio Stadium in Porto Alegre, on June 24, 2014, on the eve of a Group F football match between Argentina and Nigeria during the 2014 FIFA World Cup in Brazil. 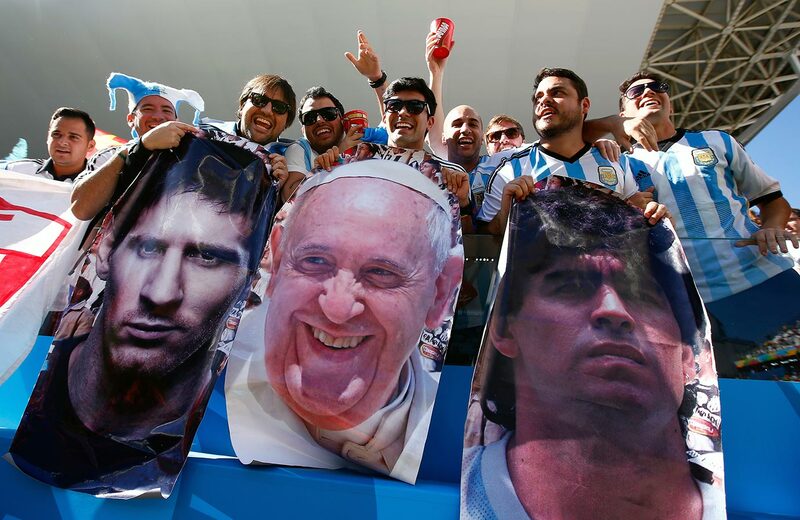 Argentina fans hold posters of Lionel Messi, Pope Francis and Diego Maradona prior to the 2014 FIFA World Cup Brazil Round of 16 match between Argentina and Switzerland at Arena de Sao Paulo on July 1, 2014 in Sao Paulo, Brazil. 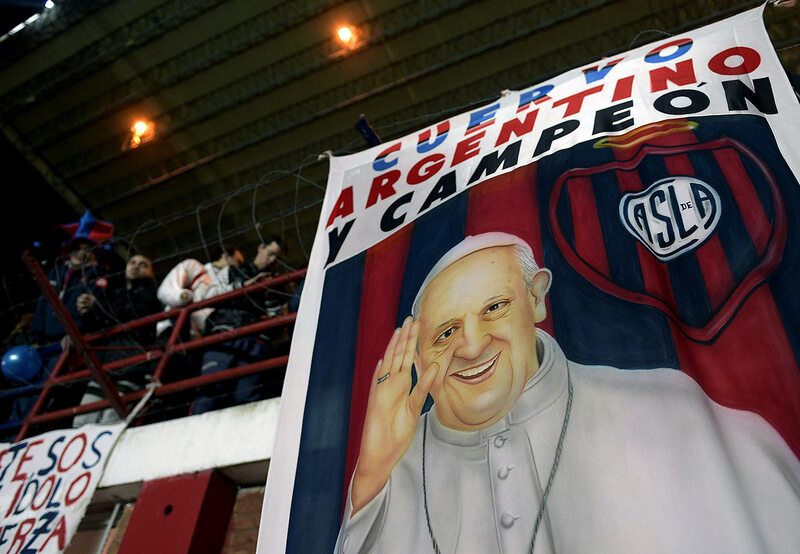 A banner with the image of Pope Francis hangs from a stand of Pedro Bidegain stadium in Buenos Aires, Argentina, on August 13, 2014 during the Copa Libertadores 2014 second leg football final between Argentina's San Lorenzo and Paraguay's Nacional. 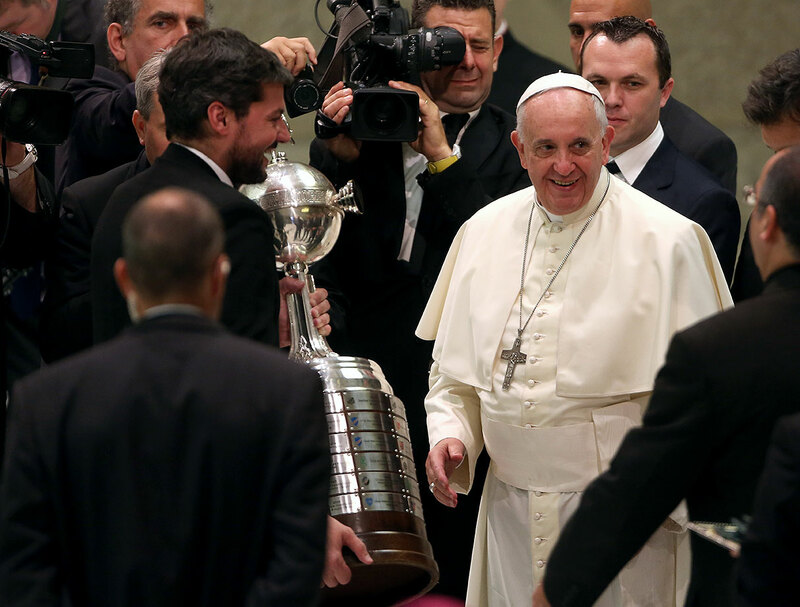 Pope Francis receives the Copa Libertadores trophy from Matias Lammens as he meets members of the San Lorenzo team during his weekly public audience on August 19, 2014 in Vatican City. 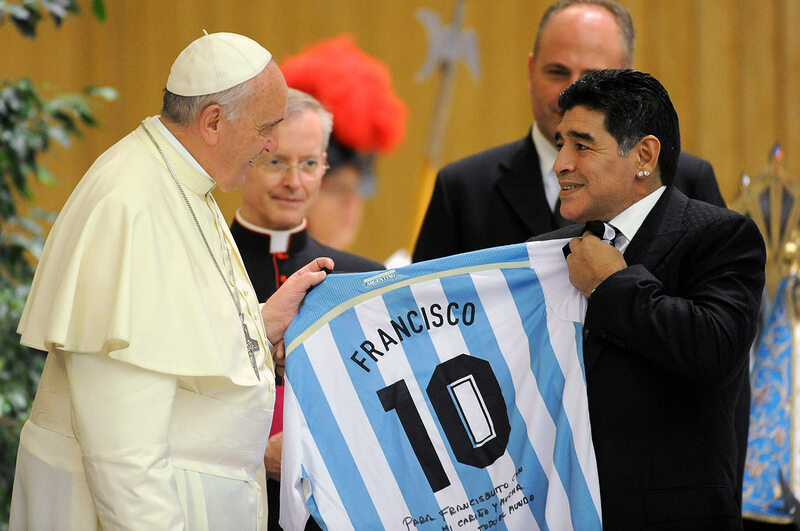 Pope Francis receives a jersey from Diego Maradona during an audience with the players of the 'Partita Interreligiosa Della Pace' at Paul VI Hall before the Interreligious Match For Peace at Olimpico Stadium on September 1, 2014 in Rome. 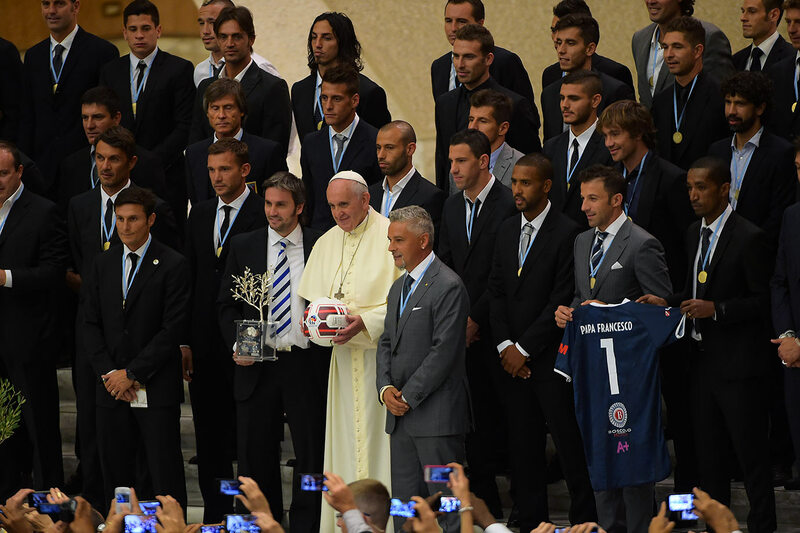 Pope Francis takes a group photo with the players of the 'Partita Interreligiosa Della Pace' at Paul VI Hall on September 1, 2014 in Vatican City. 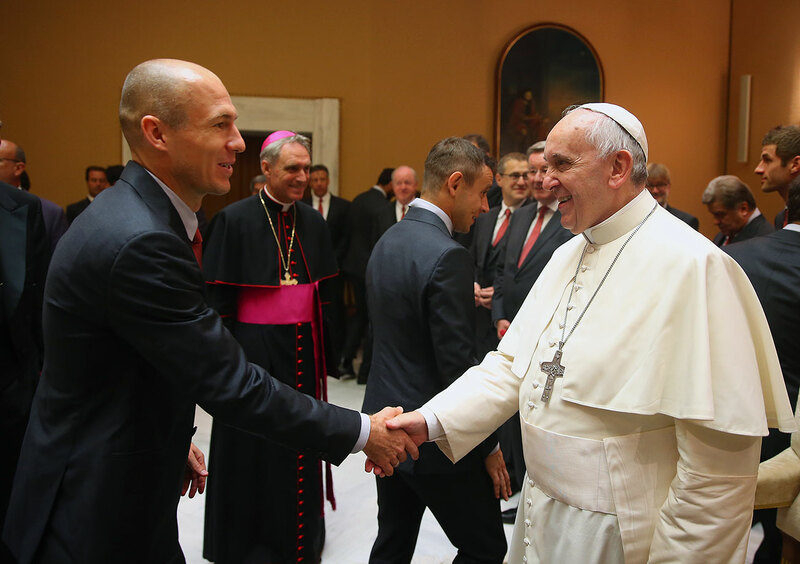 Pope Francis shakes hands with Arjen Robben of FC Bayern Muenchen during a private audience at The Vatican October 22, 2014 in Vatican City. 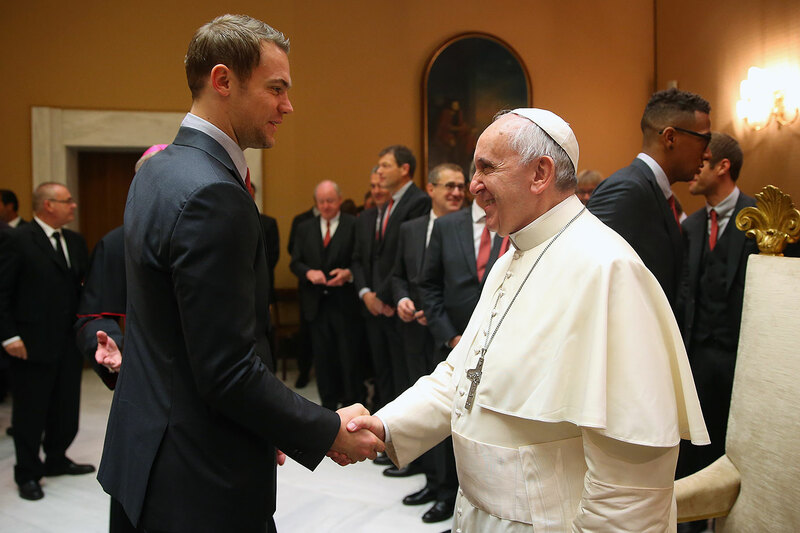 Pope Francis shakes hands with Manuel Neuer of FC Bayern Muenchen during a private audience at The Vatican October 22, 2014 in Vatican City. 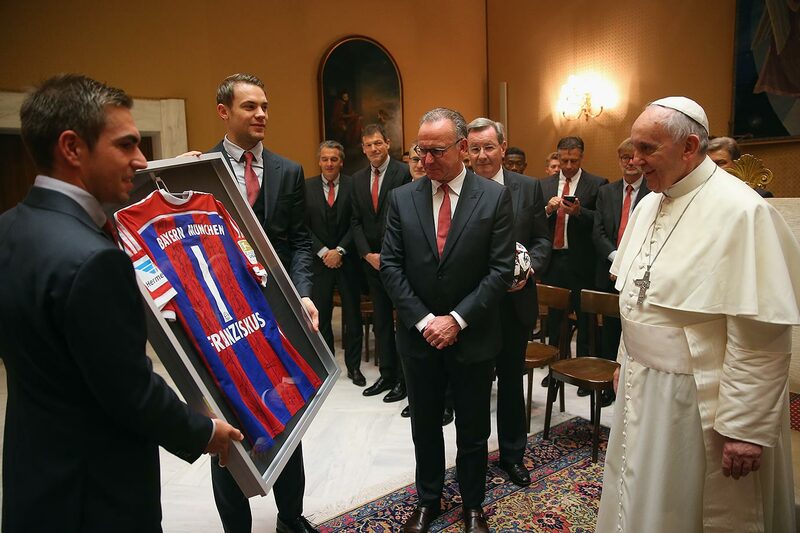 (From left) Philipp Lahm, Manuel Neuer and CEO Karl-Heinz Rummenigge of FC Bayern Muenchen present Pope Francis a team jersey during a private audience at The Vatican October 22, 2014 in Vatican City. 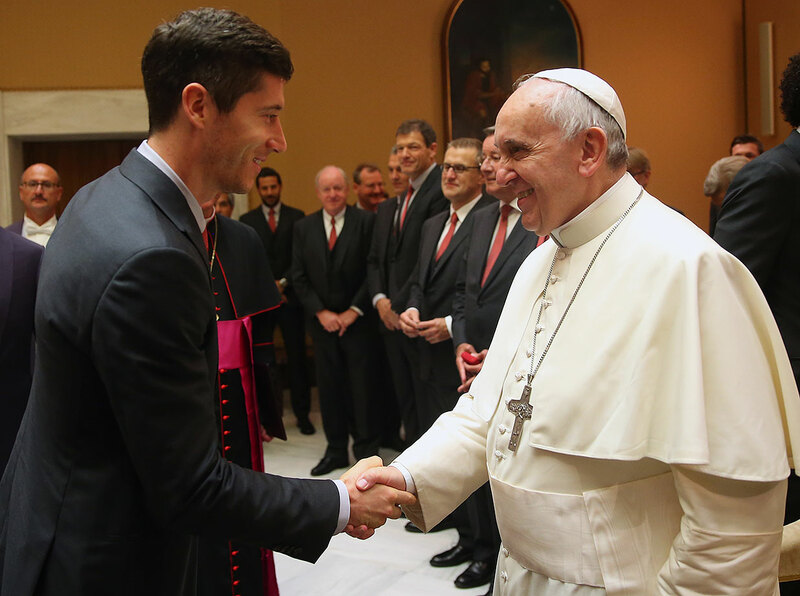 Pope Francis shakes hands with Robert Lewandowski of FC Bayern Muenchen during a private audience at The Vatican October 22, 2014 in Vatican City. 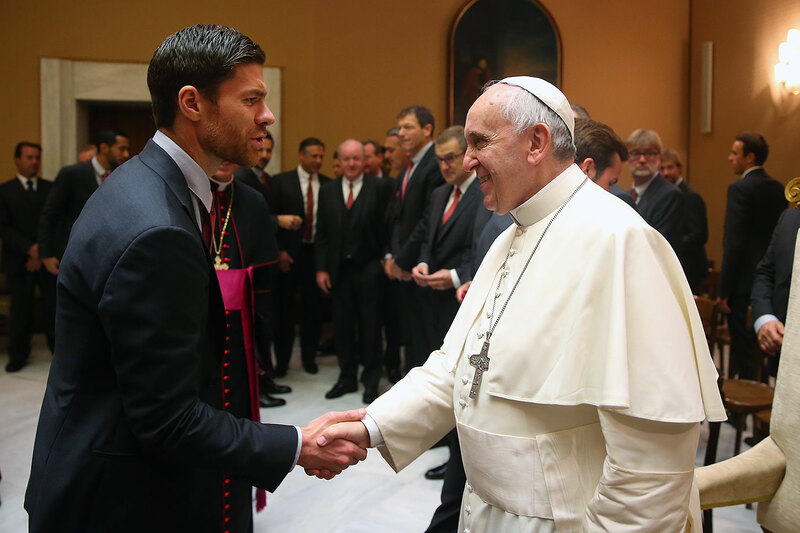 Pope Francis shakes hands with Xabi Alonso of FC Bayern Muenchen during a private audience at The Vatican October 22, 2014 in Vatican City. 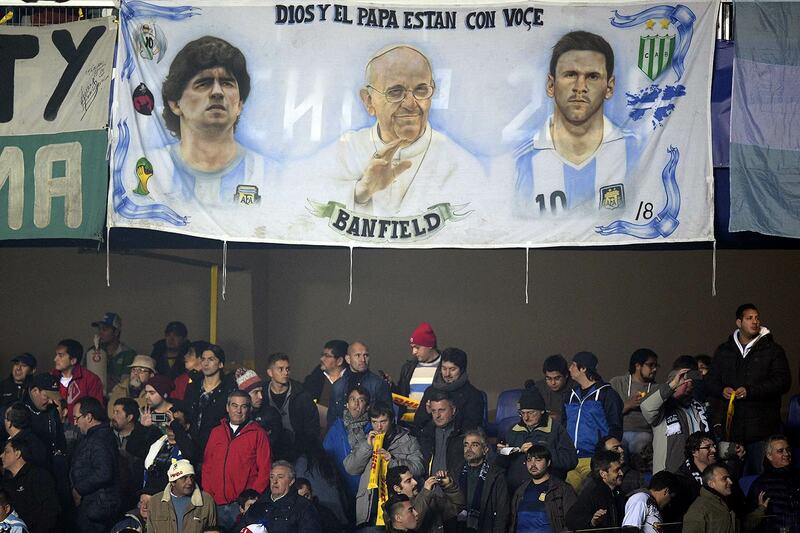 A banner depicting Diego Maradona, Pope Francis and Lionel Messi hangs before the start of Argentina's Copa America semifinal match against Paraguay on June 30, 2015 in Concepcion, Chile. 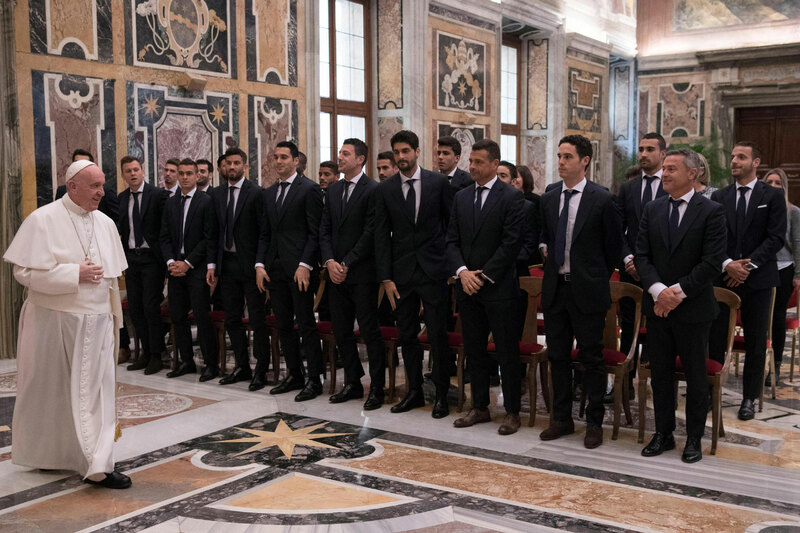 Spanish club Villarreal visits the Vatican prior to a Europa League match against AS Roma.